Does increasing the playback speed of men’s and women’s voices reduce their intelligibility by the same amount? Older adults seeking hearing help often report having an especially hard time understanding women’s voices. However, this anecdotal observation doesn’t always agree with the findings from scientific studies. For example, Ferguson (2012) found that male and female talkers were equally intelligible for older adults with hearing loss. Moreover, several studies have found that young people with normal hearing actually understand women’s voices better than men’s voices (e.g. Bradlow et al., 1996; Ferguson, 2004). In contrast, Larsby et al. (2015) found that, when listening in background noise, groups of listeners with and without hearing loss were better at understanding a man’s voice than a woman’s voice. The Larsby et al. data suggest that female speech might be more affected by distortion like background noise than male speech is, which could explain why women’s voices may be harder to understand for some people. We were interested to see if another type of distortion, speeding up the speech, would have an equal effect on the intelligibility of men and women. Speech that has been sped up (or time-compressed) has been shown to be less intelligible than unprocessed speech (e.g. Gordon-Salant & Friedman, 2011), but no studies have explored whether time compression causes an equal loss of intelligibility for male and female talkers. If an increase in playback speed causes women’s speech to be less intelligible than men’s, it could reveal another possible reason why so many older adults with hearing loss report difficulty understanding women’s voices. To this end, our study tested whether the intelligibility of time-compressed speech decreases for female talkers more than it does for male talkers. Using 32 listeners with normal hearing, we measured how much the intelligibility of two men and two women went down when the playback speed of their speech was increased by 50%. These four talkers were selected based on their nearly equivalent conversational speaking rates. We used digital recordings of each talker and made two different versions of each sentence they spoke: a normal-speed version and a fast version. The software we used allowed us to speed up the recordings without making them sound high-pitched. Audio sample 1: A sentence at its original speed. Audio sample 2: The same sentence sped up to 50% faster than its original speed. All of the sentences were presented to the listeners in background noise. We found that the men and women were essentially equally intelligible when listeners heard the sentences at their original speed. Speeding up the sentences made all of the talkers harder to understand, but the effect was much greater for the female talkers than the male talkers. In other words, there was a significant interaction between talker gender and playback speed. 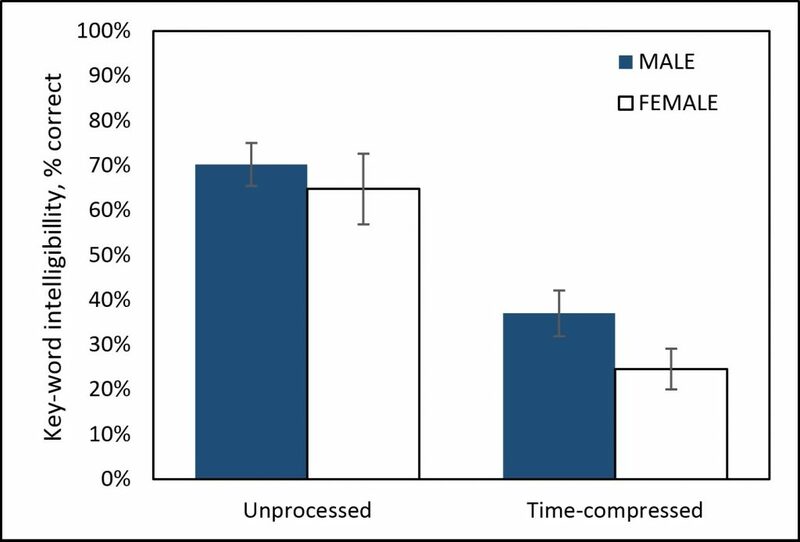 The results suggest that time-compression has a greater negative effect on the intelligibility of female speech than it does on male speech. Figure 1: Overall percent correct key-word identification performance for male and female takers in unprocessed and time-compressed conditions. Error bars indicate 95% confidence intervals. These results confirm the negative effects of time-compression on speech intelligibility and imply that audiologists should counsel the communication partners of their patients to avoid speaking excessively fast, especially if the patient complains of difficulty understanding women’s voices. This counsel may be even more important for the communication partners of patients who experience particular difficulty understanding speech in noise. Bradlow, A. R., Torretta, G. M., and Pisoni, D. B. (1996). “Intelligibility of normal speech I: Global and fine-grained acoustic-phonetic talker characteristics,” Speech Commun. 20, 255-272. Ferguson, S. H. (2004). “Talker differences in clear and conversational speech: Vowel intelligibility for normal-hearing listeners,” J. Acoust. Soc. Am. 116, 2365-2373. Ferguson, S. H. (2012). “Talker differences in clear and conversational speech: Vowel intelligibility for older adults with hearing loss,” J. Speech Lang. Hear. Res. 55, 779-790. Gordon-Salant, S., and Friedman, S. A. (2011). “Recognition of rapid speech by blind and sighted older adults,” J. Speech Lang. Hear. Res. 54, 622-631. Larsby, B., Hällgren, M., Nilsson, L., and McAllister, A. (2015). “The influence of female versus male speakers’ voice on speech recognition thresholds in noise: Effects of low-and high-frequency hearing impairment,” Speech Lang. Hear. 18, 83-90.